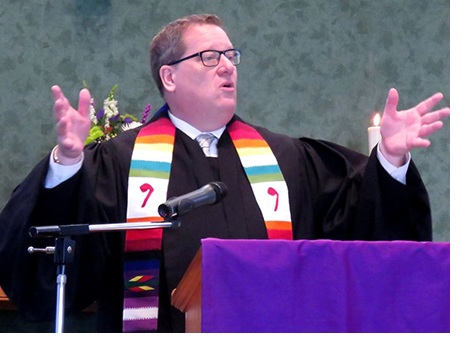 John Vertigan is the Conference Minister in the Florida Conference and a member of First United Church of Christ in Orlando. He began serving as Conference Minister on Jan. 1, 2015. Rev. Vertigan was licensed for ministry in 1989 and ordained in 1995 in the New York Conference of the UCC. He holds a Master of Divinity Degree from Bangor Theological Seminary. He served local church settings ranging from small-church rural to suburban multi-staff in New York and Illinois before being called to judicatory leadership in 2008 in the Indiana-Kentucky Conference. John's values are those of a life-long member and lover of the United Church of Christ. In the Florida Conference, he wants to build on those values of extravagant welcome, continuing testimony, and changing lives. The United Church of Christ in Florida will strive toward multicultural and multiracial community building, advance the just cause of the ONA movement, and recognize the growing need for churches and buildings that are widening their welcome to the developmentally challenged while expanding their accessibility to persons who are physically able in ways other than the majority population. Engaging the community beyond the church is vitally important, and John is building on our relationships with the Coalition of Immokalee Workers, the Fair Food Program, Equality Florida, NextGen Climate Change, and other wider church and community partners with whom we can advocate a just peace for all people and for the earth. "I also recognize that not everyone in the UCC clings to these particular values with the same tenacity as I do," John says. "My greatest hope is that the Florida Conference will embody a covenant of welcome, mutual respect and engagement across the spectrum of social and theological understandings. When we come to the table vulnerably and willing to greet each other with Christ’s peace, we build the beloved community and further the realm of God." John serves as a member of the United Church of Christ Board and on the Board of Directors of the United Church of Christ Insurance Board. Rev. Vertigan may be contacted at jvertigan@uccfla.org.